We received a reply from the grant foundation we applied to and have been notified that we are no longer being considered for the grant. We, of course are disappointed, but we are not discouraged. God has brought us this far and He will continue His work through us. Please continue to pray for our church and the faithful that support it. Our passion is to do God's work in our community and any where else He would desire. This page is to keep interested persons updated on the progress of our new church building. We are very happy to inform everyone that progress is being made, although slower than we wanted. But God's timing is not always ours, and we will follow His lead as this is His project for His Church. As many of you know, we now own 7.1 acres of land at the address of 8016 E. US 22/Ohio 3, Morrow, Ohio. This land is a great blessing as we are currently land locked on 1 acre and have no room for growth. The 7.1 acres will give us the room we need to grow and provide space for outdoor programs and events. It will be such a blessing to be able to let our young people run and play without worrying about the speeding cars flying by just a few feet away. We have constructed a 700-foot drive that will give us access from State Route 22&3. This was paid for by generous donations made last year just for this purpose. We will be planting trees along this drive that will frame the entrance into the church. We plan to plant them this fall so that they will have some height by the time the building is complete. We have secured a design for the septic system that will be installed. This has been approved by the county and the land marked for its installation. After the land and building, this is one of our highest expenses. By making a down payment, we have ordered the 130' x 80' steel building. We have also contracted with an architect to produce the blueprints we need for the interior and parking lot, and we have those plans in hand. These will be used to obtain our building permits. 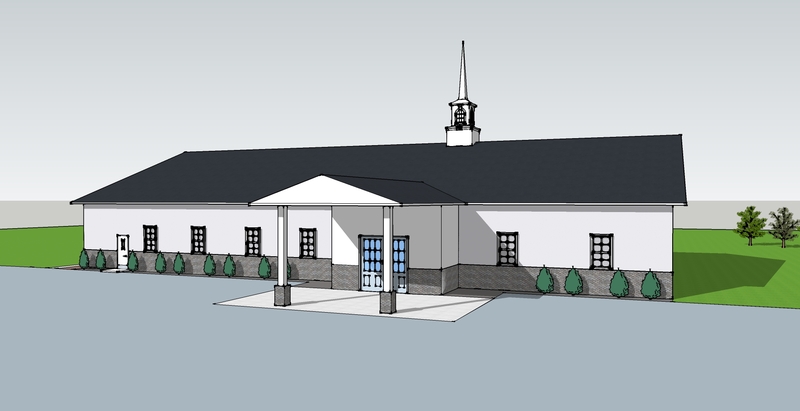 Pastor McGuffey has completed an application for a grant that could pay for the entire sanctuary space. This is where you can help us in a powerful way. We need your prayers that God will have His will in this decision. Without this grant, we will have to, once again, delay the start. But it will not stop us. We have seen how God has taken a small congregation and performed a great work through it. This is God's work and His plan, and it will be completed by Him. However, He always wants us to participate in the family business as any father wants his family to do. Please, spend a little time each day and ask God to continue with this construction so that we will have more room to invite more people to come and worship Him. If you would like to donate monetarily to this work, we are also happy to accept that as well. Our world is being engulfed by the darkness more each day. It needs the Light of Jesus Christ to show them the way of salvation. Pray that God will complete His work and put His Light on the Hill for all to see.